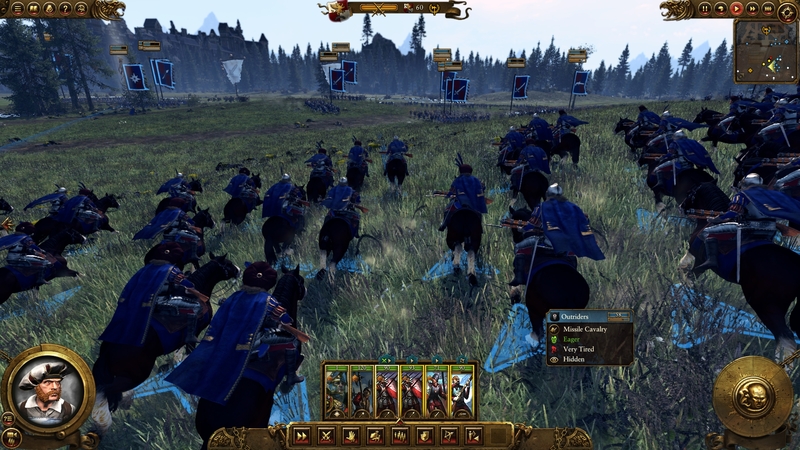 The Total War franchise is an integral part of PC gaming. It’s possible that one has not yet played at least one title, but unlikely. From the earliest days of Total War: Shogun, over to Medieval, the critically acclaimed Total War: Rome, to subpar add-ons like Alexander and completely botched releases like the massively awaited Rome II, the franchise saw it all, the good, the bad and above all the money. 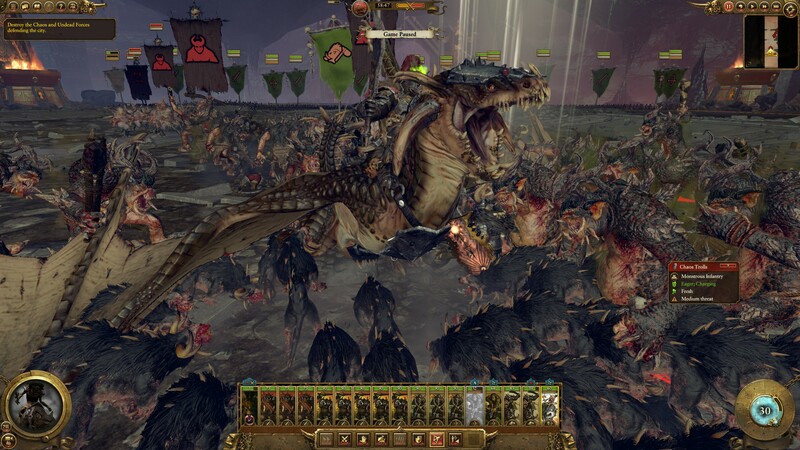 The Creative Assembly and SEGA haven’t had the wildest of track records recently, nor complete consumer faith but let us be honest, Total War: Warhammer will get bought regardless. 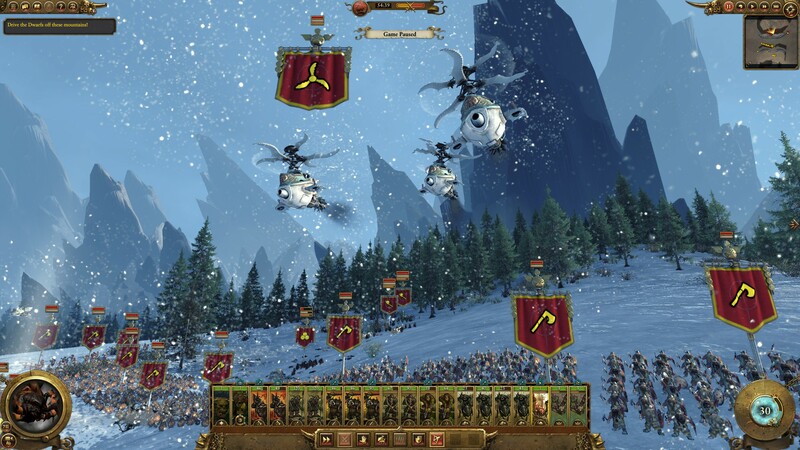 The question is, do we have another Rome II or did CA redeem itself? Total War and Warhammer, digital gaming and old school tabletop goodness. The stakes could not be set higher for this one. 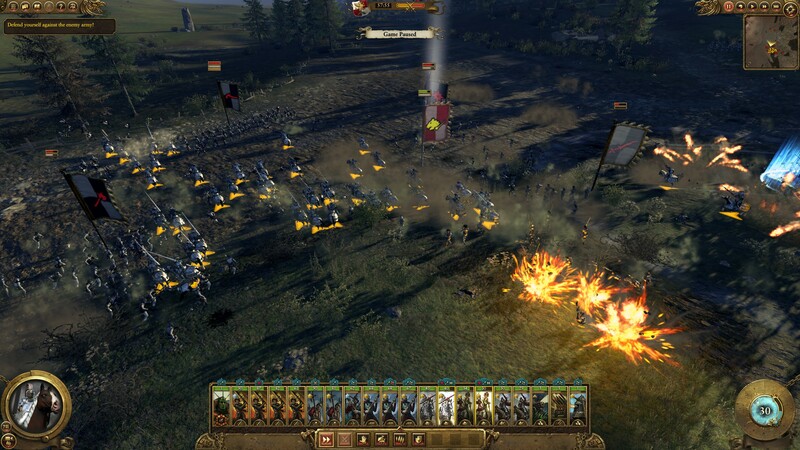 Total War fans, many disappointed at previous releases want a great game. 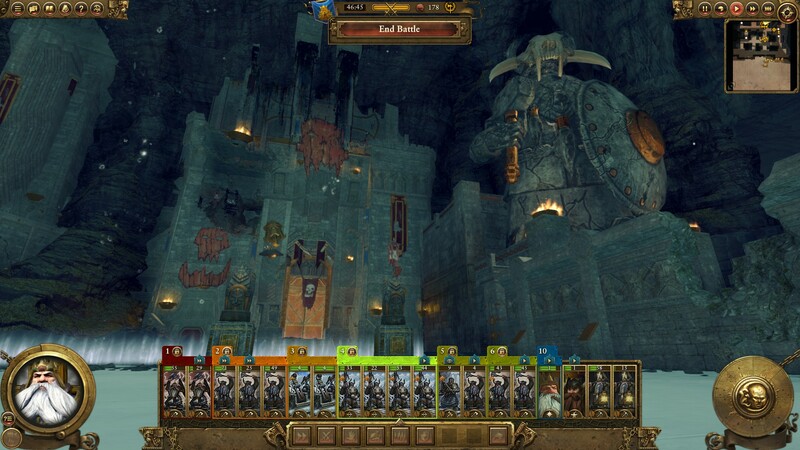 Warhammer fans want their lore respected and also a great game. Sometimes one might be both, but one still wants a great game. That said, Warhammer also offers great possibilities. A fleshed out lore, a enormous pool of units and magic, heroes and Dwarfs. In short, the stuff of legends. What can thus start out strong, can also hit rock bottom very quickly. 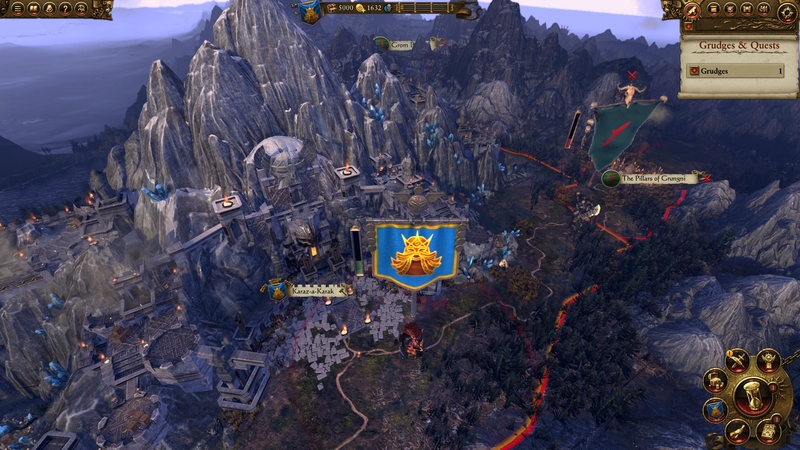 Diving right into the game, the comparatively small number of races hits hard at the core of what Total War is known for. Of course, Total War: Rome initially also only offered players three Roman factions before a finished campaign would unlock the rest. Regardless, the four to five nations out right now sting those of us that hoped for a (near) complete spectrum of Warhammer fantasy. It’s a salty taste that might get sweetened by correct DLC business decisions. Or soured. The game does certainly lack that distinctive trade mark of Total War games. It does, partially, recuperate this in race ‘quality’. 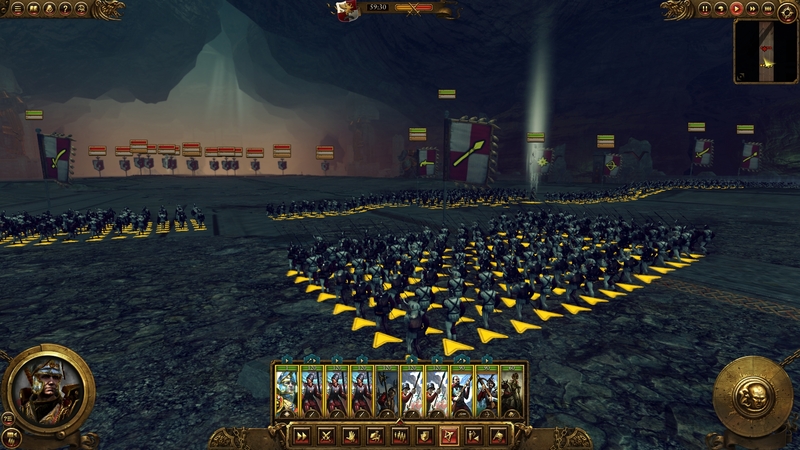 There is nothing better than letting huge armies duke it out. 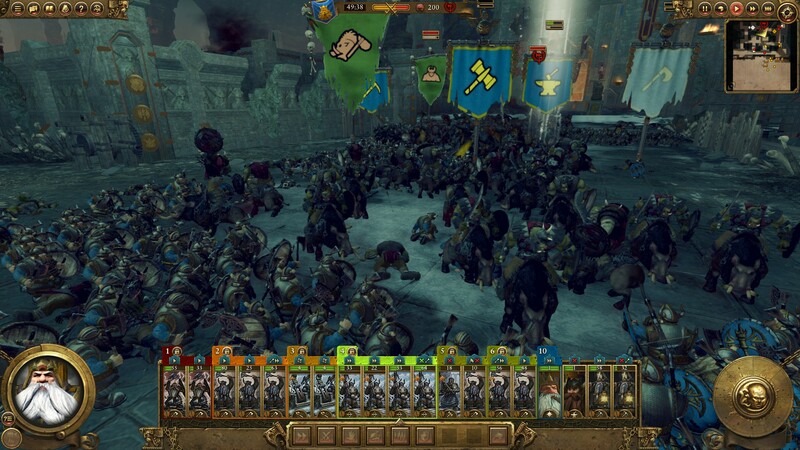 While Dwarfs and The Empire play, with lots of run-of-the-mill infantry, bows, muskets, cavalry and cannons, in a relatively straightforward manner, the Orks and Vampire Counts have some nifty game play styles that break the now stale status-quo. 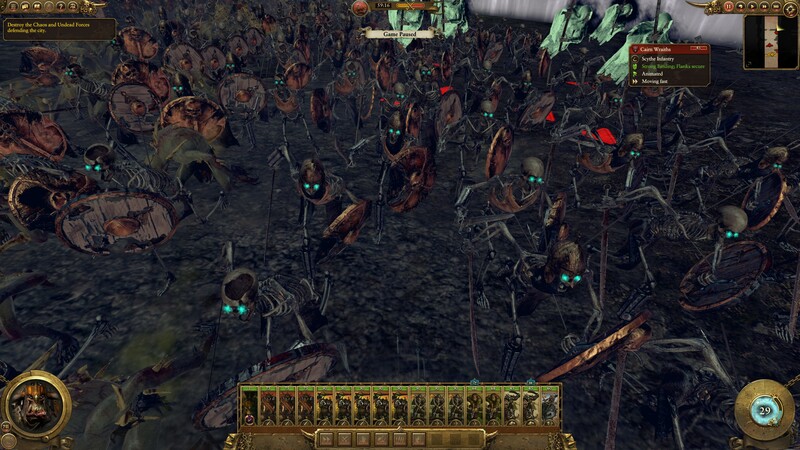 I mean, give me one Total War game that allowed you to reanimate the dead to fight for you! There is ample proof that the ‘Warhammer lore’ as one might call it, has been taken into account when creating these races. 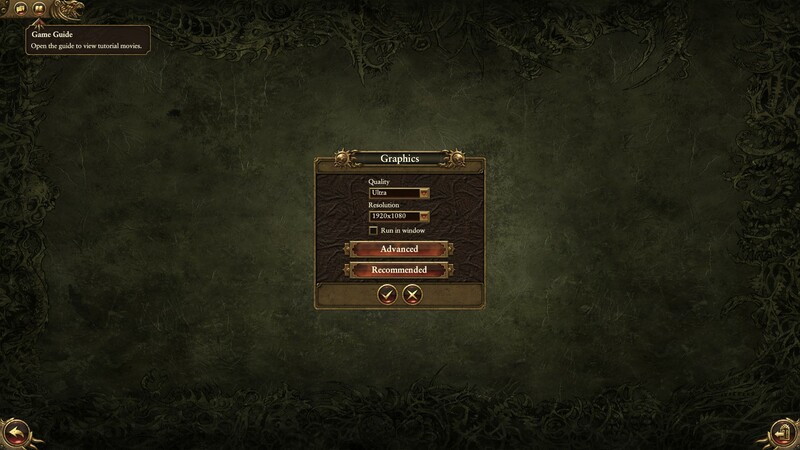 Luckily, anything else would have made the game crash and burn. 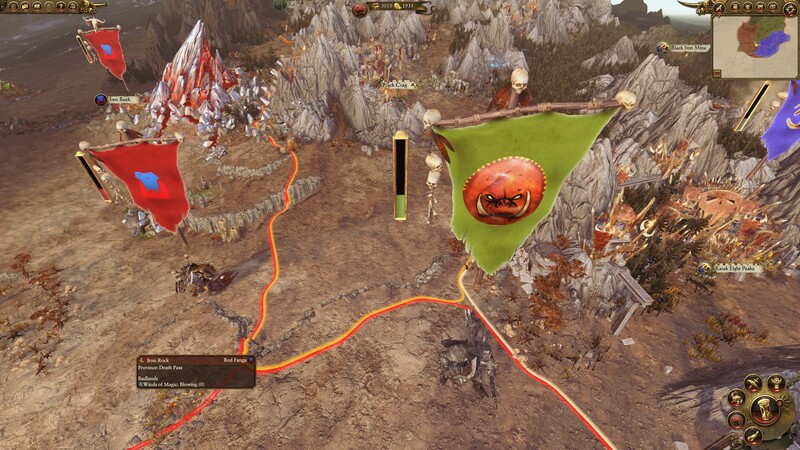 Here, criticism can made to the hard region locking of the races, not allowing them to settle everywhere on the map. 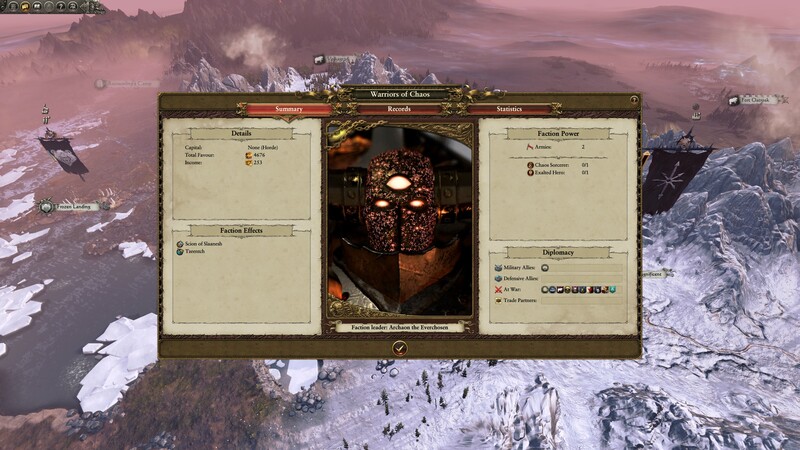 Taking that into account, I am truly thankful that CA did eventually allow Mods for their game. A quick hit of a button and this issue is fixed. But I am here to discuss the vanilla version, so back to 1.0. Battles play off as they always have, chose the target and march off to meet it. Or be met, doesn’t matter either way. 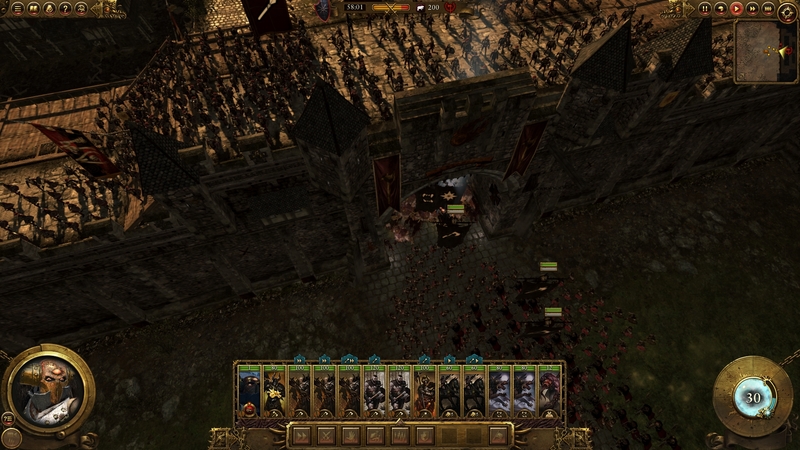 Quickly transition to the battle map, deploy and off you go to a merry slaughter. Here, Total War brings in something new. 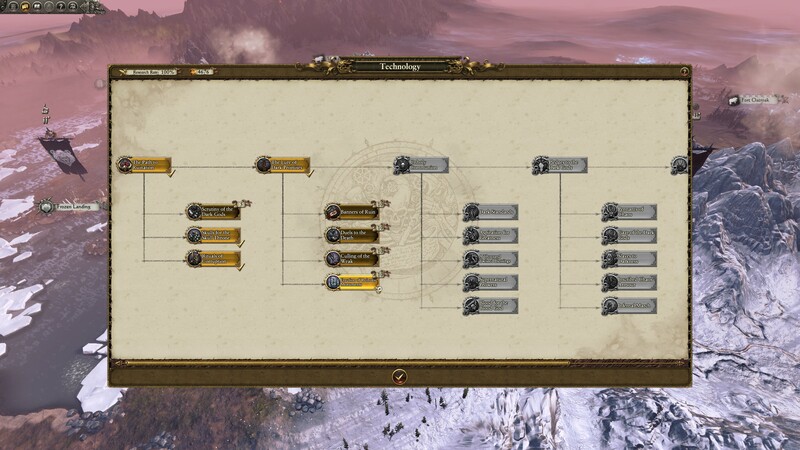 Not only do your Heroes and Lords have specific skill trees allowing for a ridiculous god of war, a brilliant strategist or a logistic expert, but Magic has found its way to the field of glory. We’re not just talking about puny fireballs or inspirational magic here, no, I mean you can literally cast down a meteor on to your foe! 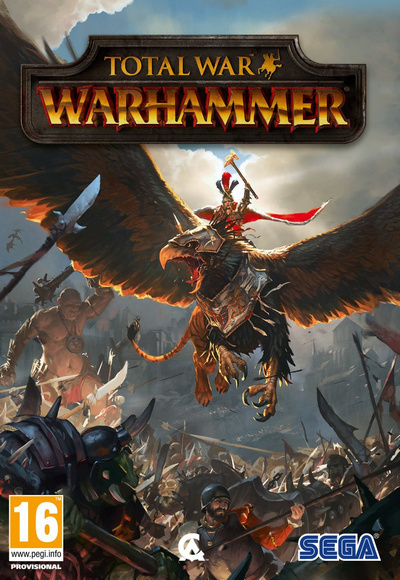 Warhammer without Magic? Unthinkable, I am glad it’s in and that it works. That is reach too short however. Magic works, yes and it livens up the game. Special abilities too make more ‘sense’ in this fantasy world than, let’s say, ancient Europe. Do I feel that it has an impact? Well, in-game it does of course. Those ‘umies stomped by Gorks magical shoe won’t challenge that either. 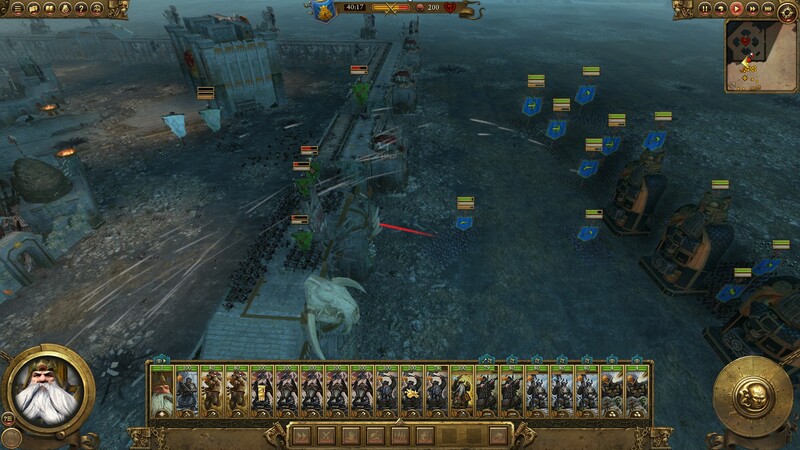 That said, Total War is limited in its basic mechanics. After a few dozen battles, you’ll find little difference to those you fought in Shogun, Medieval or Rome. Even gods can’t stay out of this. Yes, yes, more colours, different races, gyrocopters, dragons and all that good stuff. It’s great seeing these creatures I once played with on the tabletop come alive and rip at each other just like my imagination once made it do for them! But we have seen it before and it doesn’t take an overzealous yet intelligent goblin long to figure out that while the new diversity breaths fresh air into the engagements, beautiful and epic as they are, they are still the same, albeit with less kill animations. Speaking about intelligence, the AI. I am going to be frank, I don’t expect anything off CA anymore in that part of the equation. Neither should anyone. Even with their hard work – and we thank them for it – it never works out. Even mods have their limits. I might leave it at that, but let me dig a bit deeper. The AI ‘seems’ better. 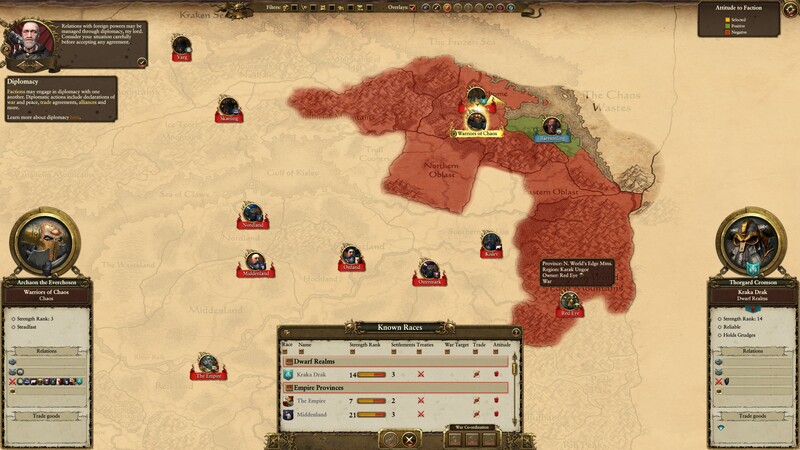 Especially initially it seemed to me that some improvements were made to both diplomacy and battle AI. Speaking of the former, I’ve not seen complete diplomatic failures, but I have experienced some peculiar (but beneficial) moments. As for the latter, on a closer look, you can decipher a general pattern and it’s straightforward – hard locked decision making. Variable X + Y means Z. Cavalry will try to hit your flanks, hit and run, rinse and repeat. 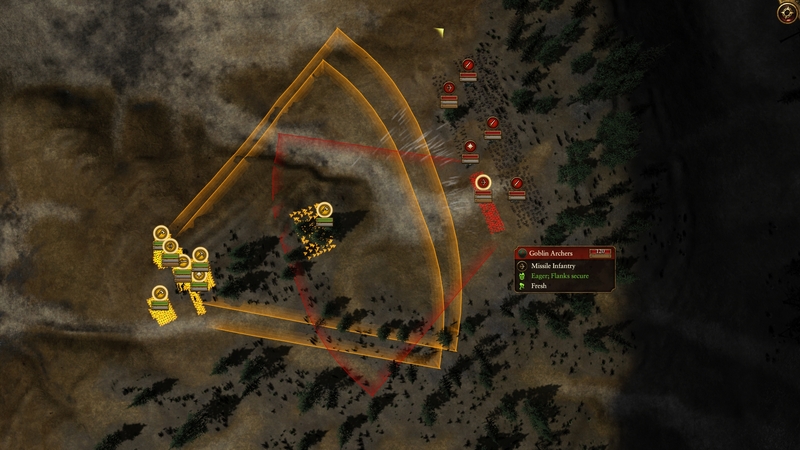 Archers will stay back and skirmish (although holding/shifting fire to avoid hitting friendlies) and the infantry charges straight up the middle (no Schwerpunkt or anything) as Artillery rains death from behind (with a focus on the biggest clusters)… The best example I can give you is this: create a breakthrough during a Siege and the AI will move into defend the breach. So far so good, problem is, it will then, think that the job is done, simply keep its unit standing there. Now all you got to do is move up a ranged unit and pick them off one by one. No response, no running for cover, no counterattack. Enjoy. 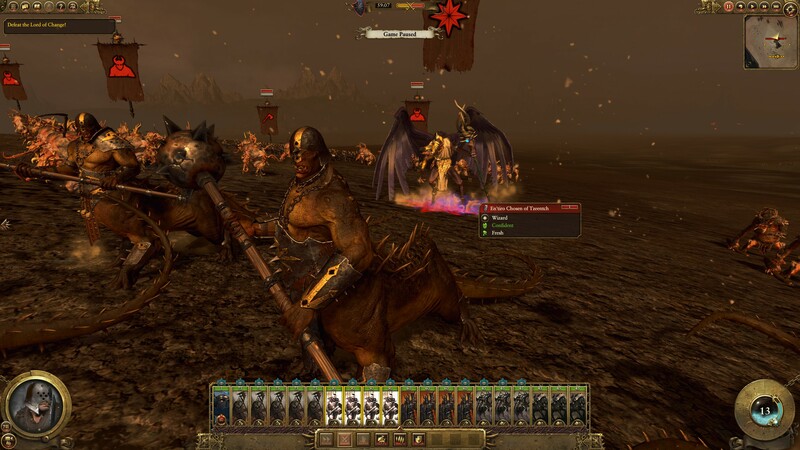 While I was initially taken aback by the tempo of the battles, once you know the general patterns, battles become as they always have been in Total War, grandiose, epic but unchallenging. We are used to it. At the end it will all be just one color. 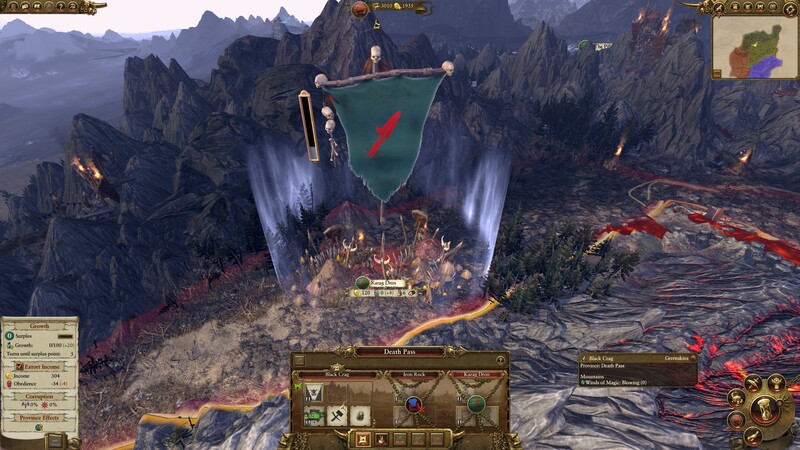 Total War: Warhammer is a great basis. It has charm, looks great and it even innovates in a reserved, probably one off Total War kind of way. It also suffers from Totalwarism, the AI and monotonous conquer, conquer, conquer (now within certain bounds) and smash everything and everyone. Quest battles aside, it is still pretty much like that. Ultimately the set monotony was always the problem with these games, starting a new campaign being the only way to hold longevity. Right now, the replay value comes as the game has half of its race pool as a truly ‘different’ experience. That is additionally helped by mods. Is this a gloomy premise? It could be but with the title being a solid basis, it could, with the right kind of DLC packs (and no, not the rip of kind of ones), add to its strong points and help these overshadow the rougher edges and, with no fault to the developer, inherent Total War monotony problem. 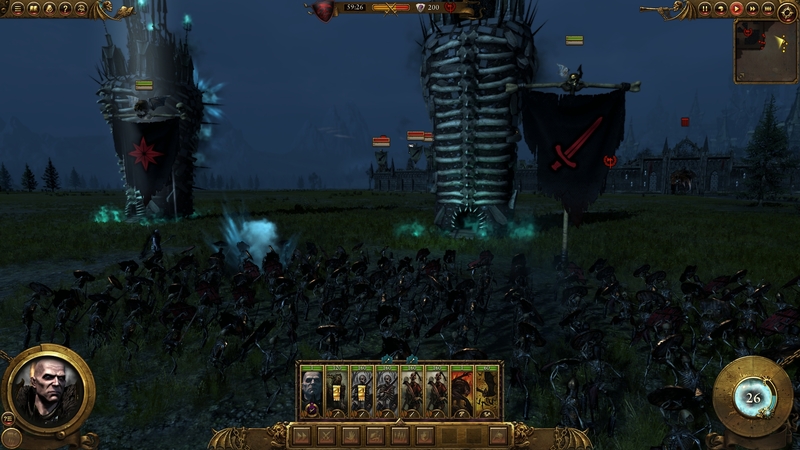 To number crunchers, the score might not make Total War: Warhammer look all that good. Numbers and the rating system we are stuck with are at fault. Thus, here is the cut as it is. 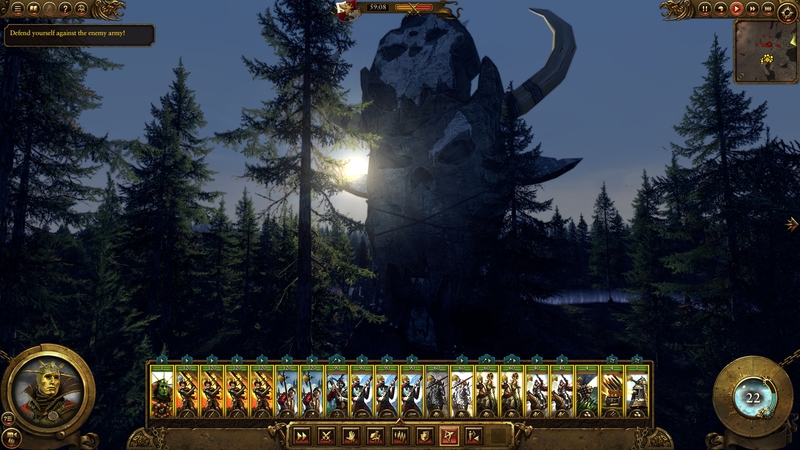 Total War: Warhammer is not a botched game. Even though it has a seemingly low score, I feel more for this title than vanilla Rome II. It shows a respect to the lore that I, in turn, can respect. 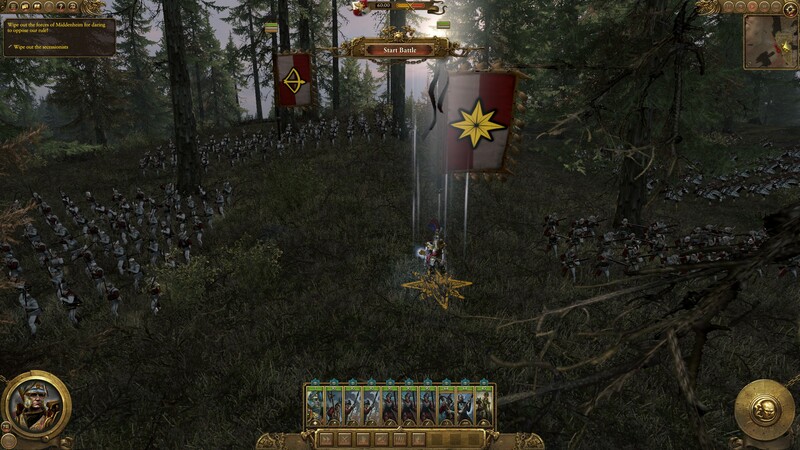 Warhammer lore fanatics might disagree, but a working balance was found. But I do think that this isn’t the end for this game, that more must come to truly round off the picture. Until then, mods are there for the taking. 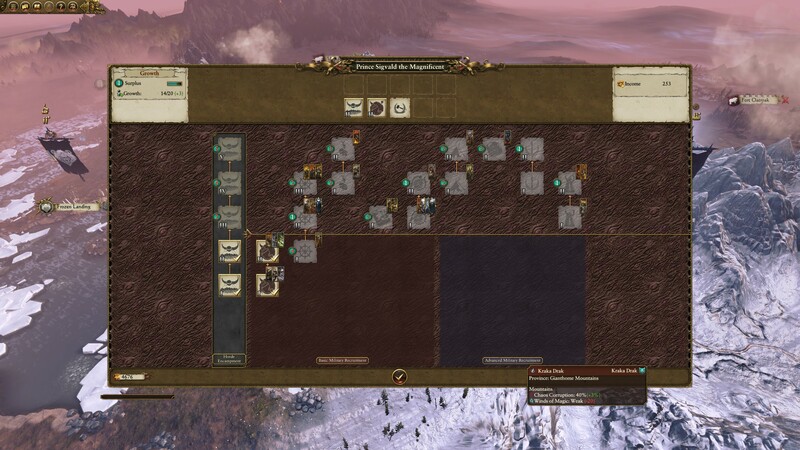 With the inevitable DLC expansion in the pipeline, what we need now is smart and consumer friendly business decisions to reset Total War to its former glory. Because that could very well happen. 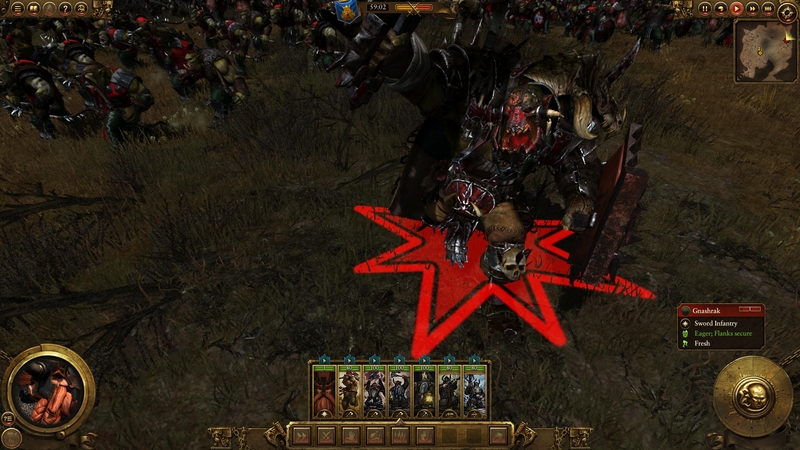 Warhammer: It has come alive! Innovation: Magic, Quest battles and extensive Hero customization give much needed variation to the franchise. Steam Workshop: Allowing mod support was an excellent decision. 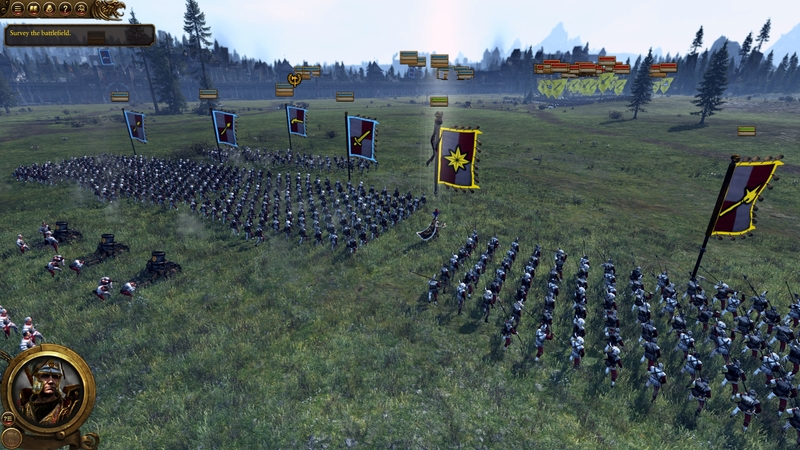 Limitations: Mods circumvent development decisions that could irk Total War enthusiasts. Race Choice: Diverse and the ordinary, all in one package. Longevity: Reliant on further post launch support. AI: Do we still expect anything? A fantastic basis that Creative Assembly has to build up. 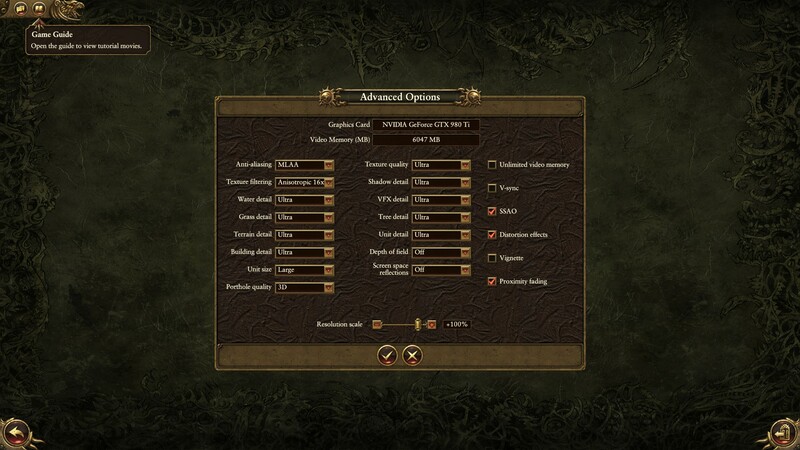 Graphics: Complete customization of graphics as per previous Total War games. 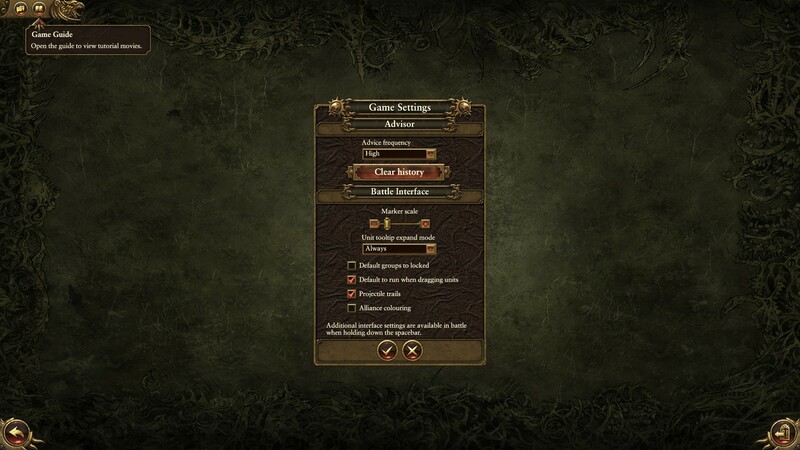 Settings split through three screens: basic quality, resolution and display mode setup, brightness and gamma, and advanced options. Game optimized for AMD but runs well on an NVIDIA powered machine as well. Audio: Full array of volume options. 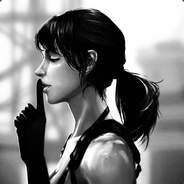 Ability to set up audio quality, sound system type and fully configure voice chat system, including boosting microphone or setting up push-to-talk. Controls: Everything is customizable. 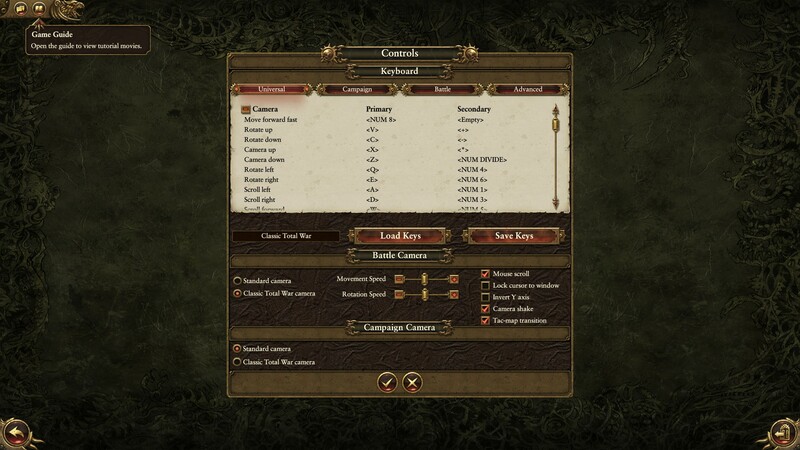 Set universal, campaign or battle keys. 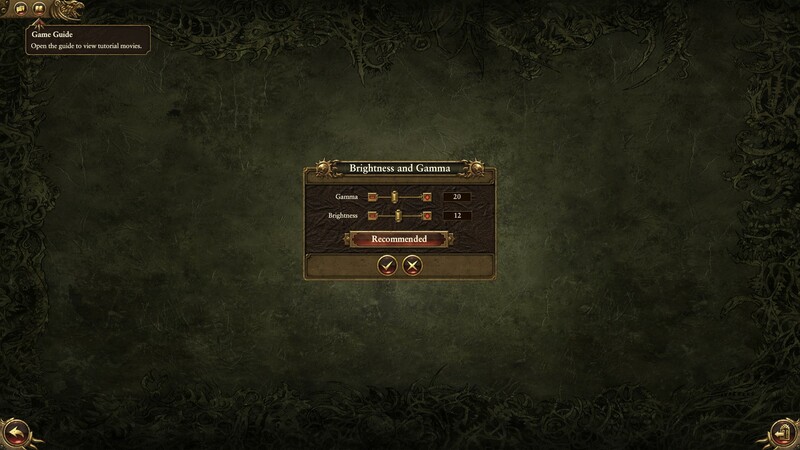 Fully customizable camera settings including the ability to select between classic TW and standard camera in both, campaign and battle modes, or ability to disable camera shake. 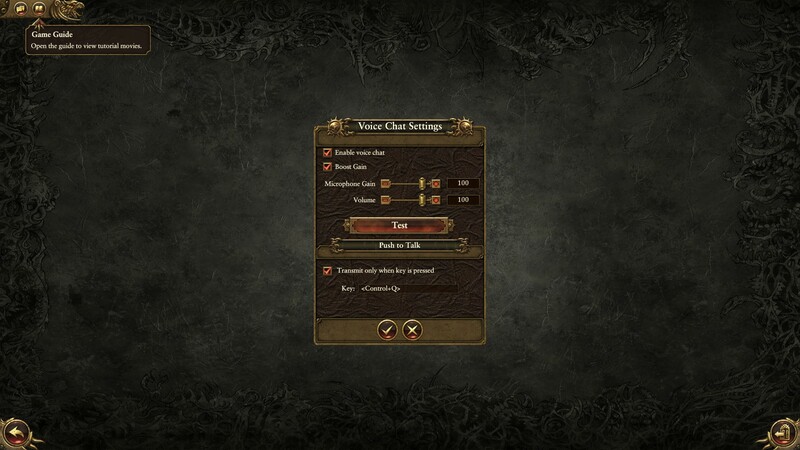 Game Settings: You can chose how much or how little you want to be interrupted by an advisor or set up additional visual aids. 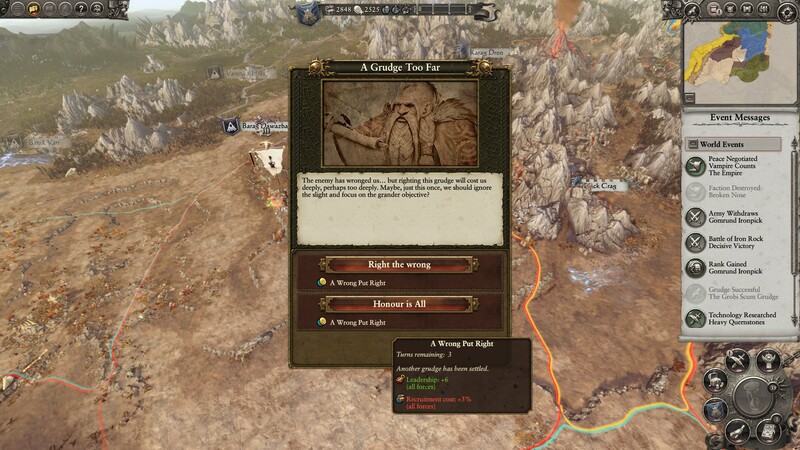 As somebody who isn’t fond of the Turn-Based Strategy genre, Total War: Warhammer is a title I can appreciate with its in-game help guide and enthralling presentation. 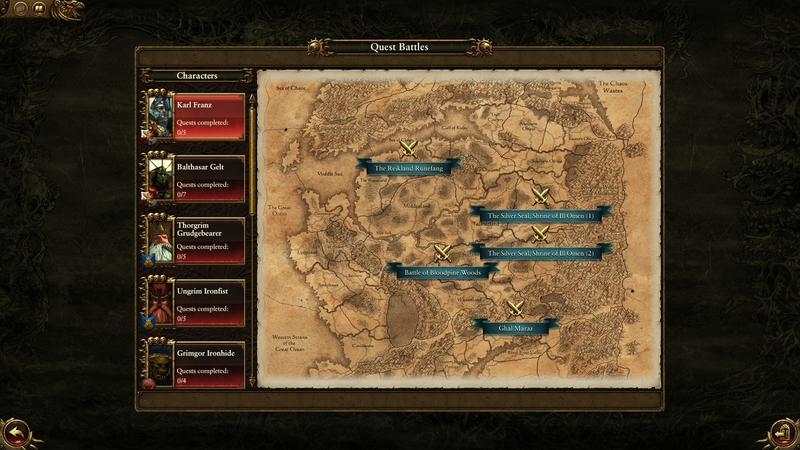 Jumping into the game without much of a background in Warhammer lore won’t be puzzling when figuring out where to go or what to do, with it’s easy to follow introduction and well-designed user interface you will have no troubles adjusting. 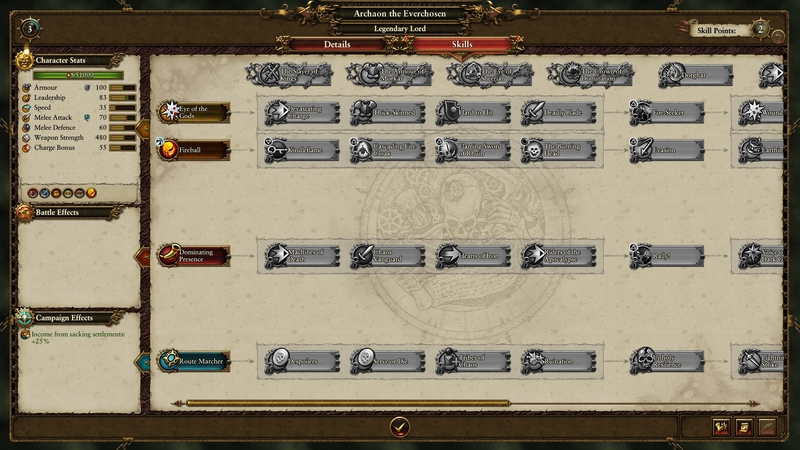 Heroes and Lords are customizable, you can choose their equipment, talents and steer their progress how you like throughout the campaign. 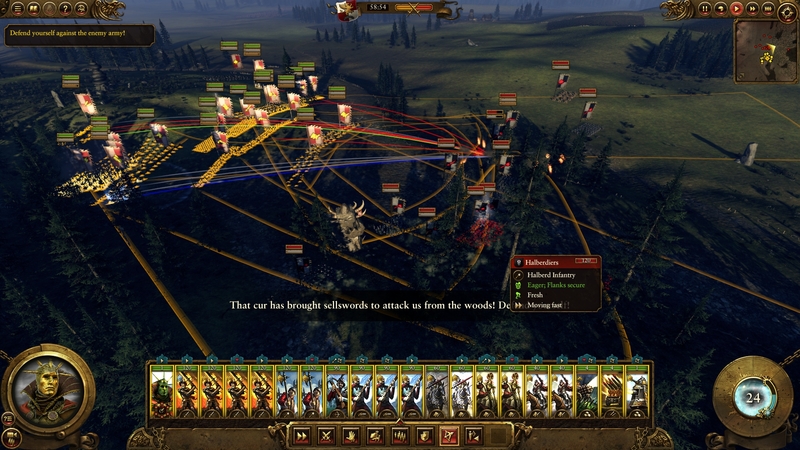 The campaign AI is a lot more intelligent than previous Total War titles, enemies and opposing factions have varied responses to your playstyle and are less predictable. 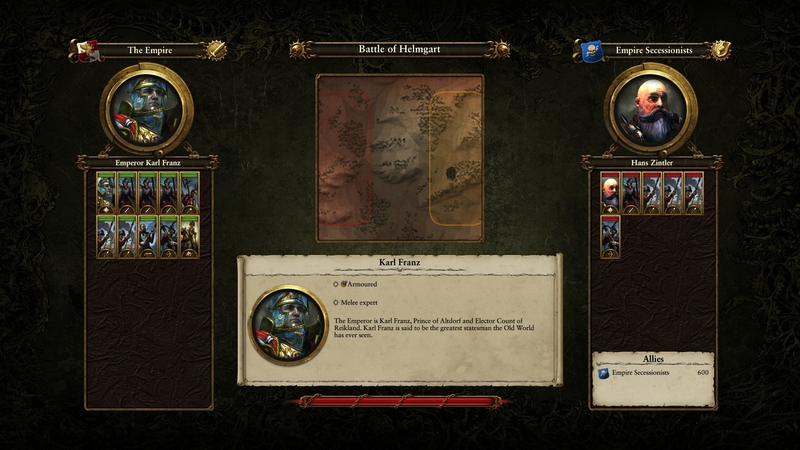 Adding a new layer of gameplay complexity to the Total War experience is the in depth magic system that is added based on Warhammer lore. Amidst your battles you will be treated to a gorgeous soundtrack by Richard Beddow that adds to the overall immersion and that Warhammer feel. To compliment the music is the very well delivered voice acting. 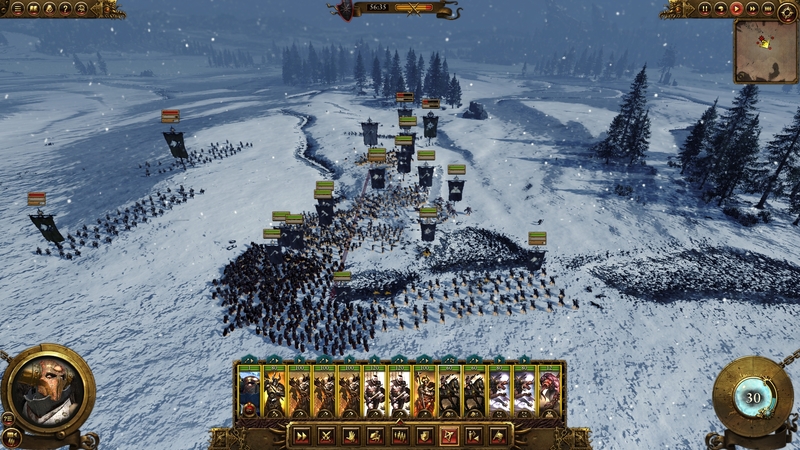 Being the latest Total War release you would expect a graphically demanding game, although, optimization is improved from previous titles and the game still looks amazing. 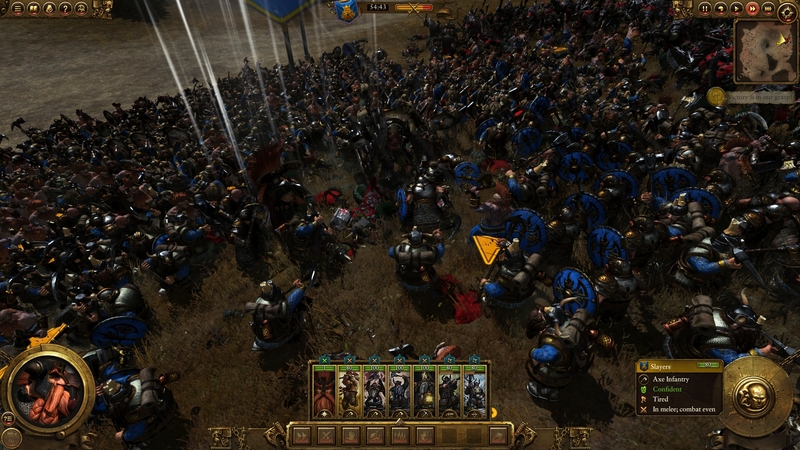 Armies can battle against each other with massive unit sizes and you barely drop in performance even at higher resolutions. 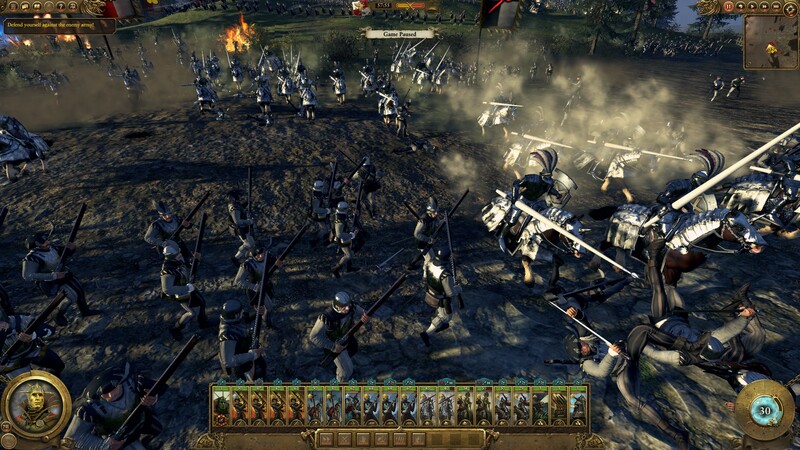 In closing, for Creative Assembly to make Total War: Warhammer a lot more welcoming to gamers who aren’t fans of the genre, they needed to change many aspects of the gameplay and mechanics which unfortunately won’t sit well with some Total War veterans. 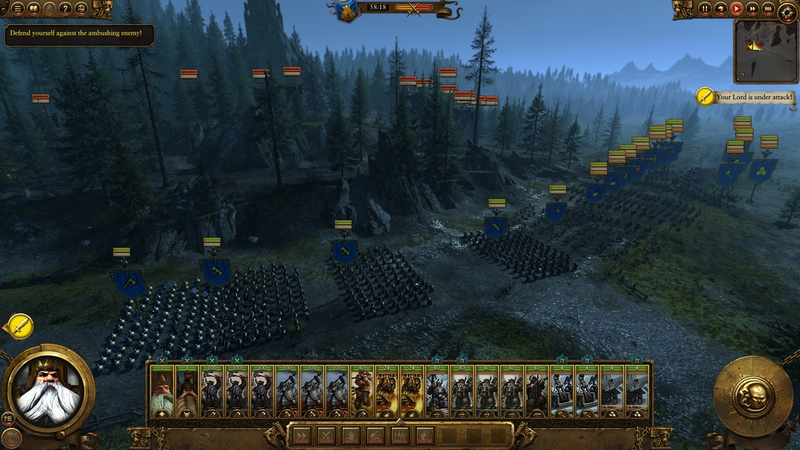 Albeit even with those changes to the Total War flavour the game has a mountain of content that will satisfy most gamers for hours on end. 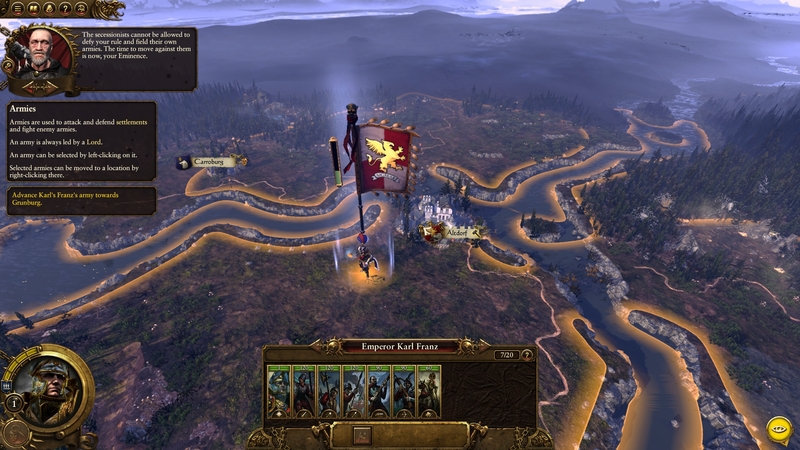 After 16 years and 14 separate games, the Total War series has finally officially produced a fantasy game. 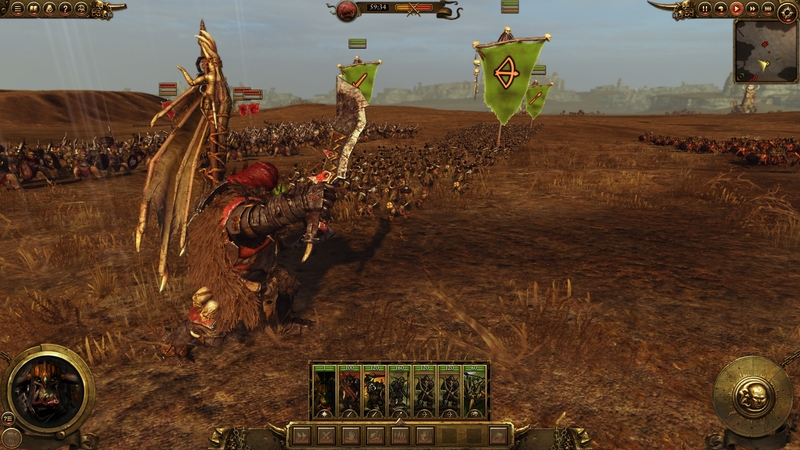 Total War: Warhammer has been greatly anticipated by Warhammer and TW fans alike. 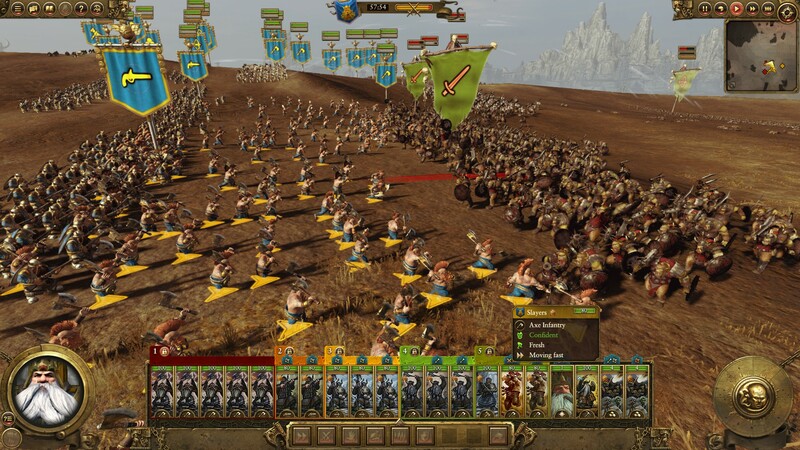 However despite the TW being essentially the same game for the last 14 iterations, Creative Assembly has at last changed two of its core elements: realism is giving way to fantasy, and strategy is giving way too…derp. 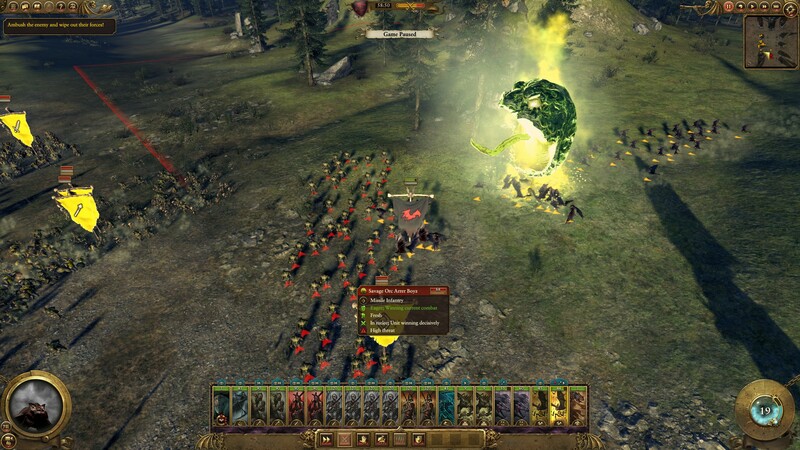 Total War games are empire management games, and this core to their appeal, but the management component in TWW has been sharply abbreviated. Cities have lost immersion, being reduced to a few generic icons no longer recognisable as buildings. Resources have been reduced to just population and money. Culture progression has all but been removed, advancement is now tailored almost entirely on just leaders and magic. Diplomacy still exists but is of minimal use, when the best (and often only) strategy is to go to war with everyone. The entire management section of the game is now dominated by army recruitment, deployment, with some token income decisions for good measure. 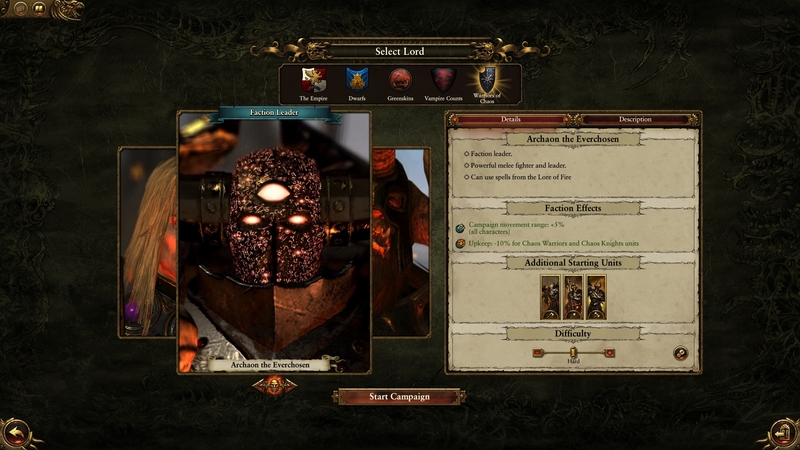 There are a few deeper mechanics present in the strategy portion of the game, such as loyalty, obedience, growth and corruption. But these are out of your control most of the time. What’s worse is that all these mechanics have been heavily obscured by an unnecessarily complicated UI, and a less than comprehensive game guide. 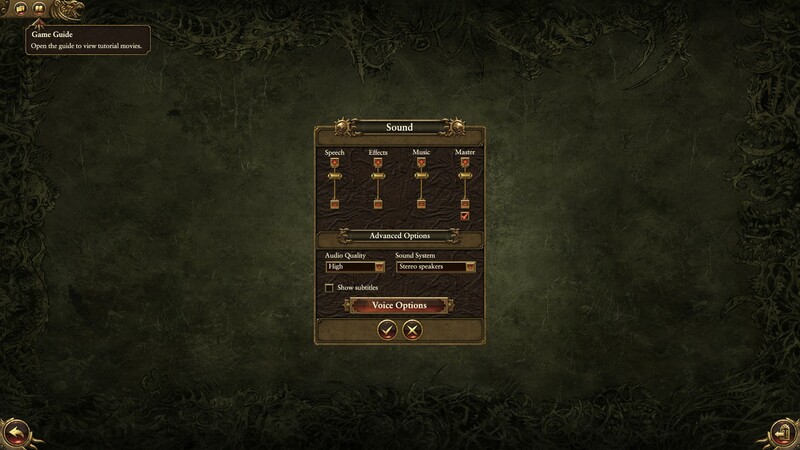 Seriously I’ve discovered as much about these mechanics through luck as I have through the tooltips and the guide. One good thing I can say about the strategy side of things, is how each race has unique mechanics that influence their general play style. 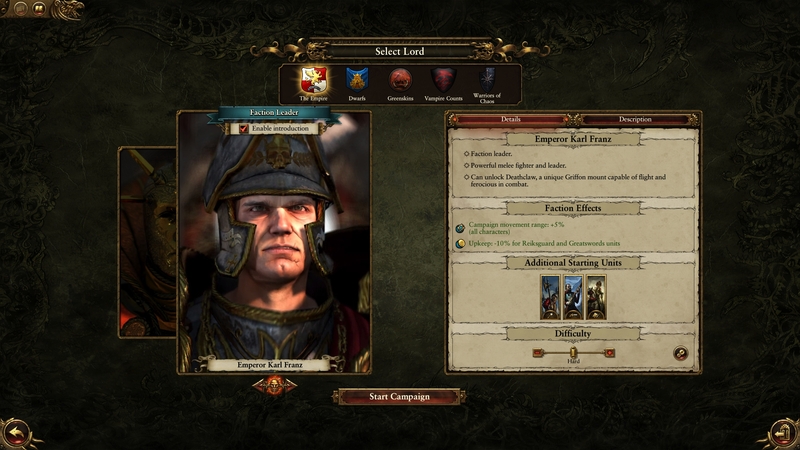 Not enough games are brave enough to introduce an asymmetric style, so I applaud creative Assembly for this. 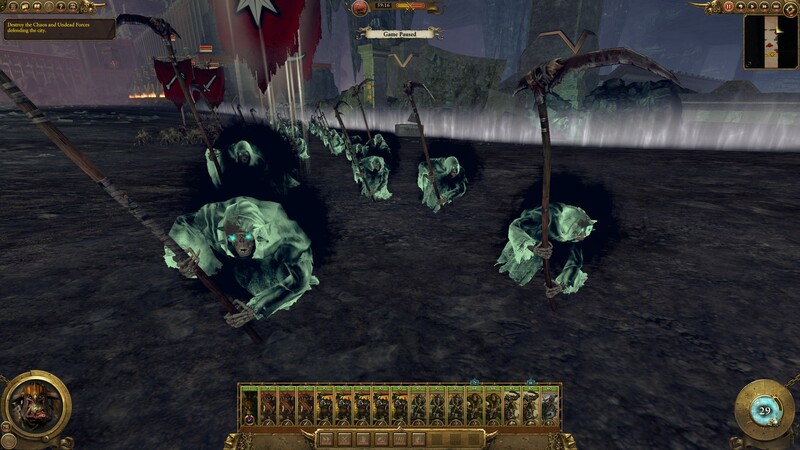 However some of these race mechanics are again heavily obscured (such as the greenskins fightiness), although the unique cityless style of the Chaos faction, makes for a refreshing change. The TW series has stagnated somewhat over the last 16 years, with certain flaws remaining unaddressed over all this time. 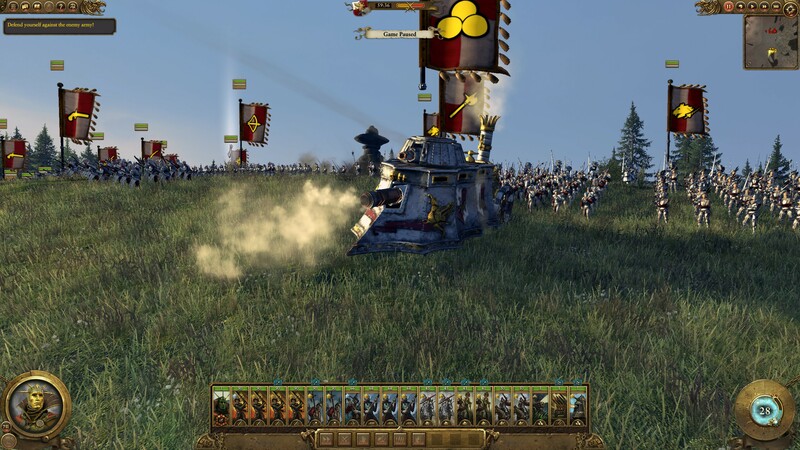 Battlefields and locations tend to be lifeless, and in cities and sieges this problem is more pronounced, where the only movement seen is from units and troops involved in the actual battles. 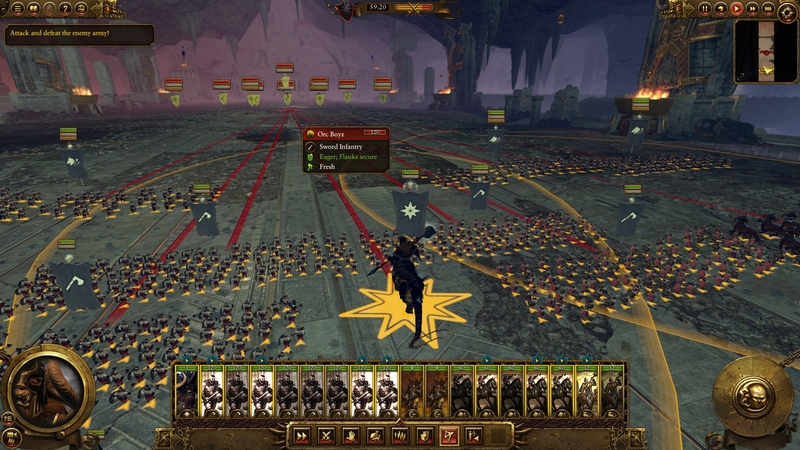 The capturing of cities and villages have very arbitrary conditions; with players being required to gather their units within a circle at the centre of these locations. All this contributes to a loss of immersion. 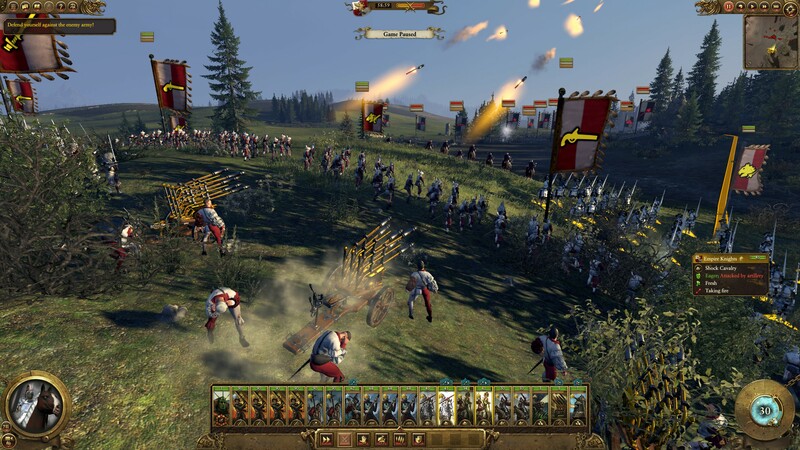 Compared to Rome II: Total War the controls and strategies available in combat are largely unchanged with a few omissions: unit stances, scout units, surprise attacks, and concealment mechanics as a unit ability rather than just hiding behind terrain. Magic does add some new tactics but spells on their own won’t win you a battle, plus it takes a long time to discover any real powerful spells and even then they will have limited usage. 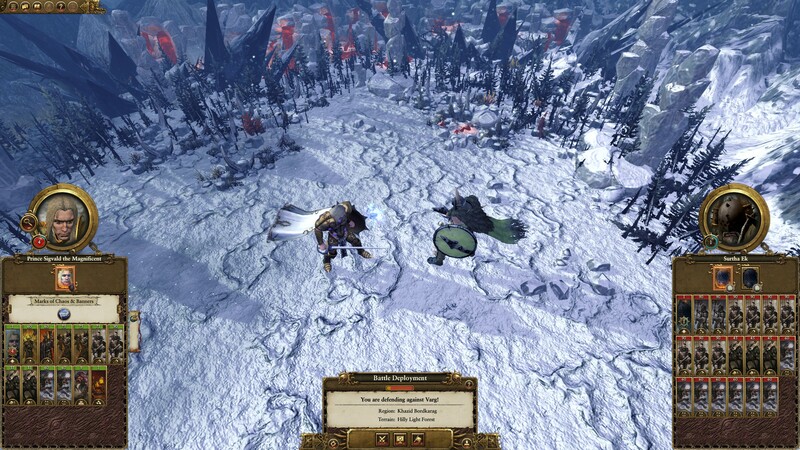 Monster units like dragons and giants really add to the epic feel of combat. Battle environments are sometimes quite stunning and perpetuate a feeling of awe about them. Underground locations are particularly gorgeous and captivating. Magic does add a degree of excitement. Leaders are also more extravagant and pivotal to a battle. The addition of all fantasy elements has worked well, and despite the issues mentioned above, combat is more breath taking and fun than ever. 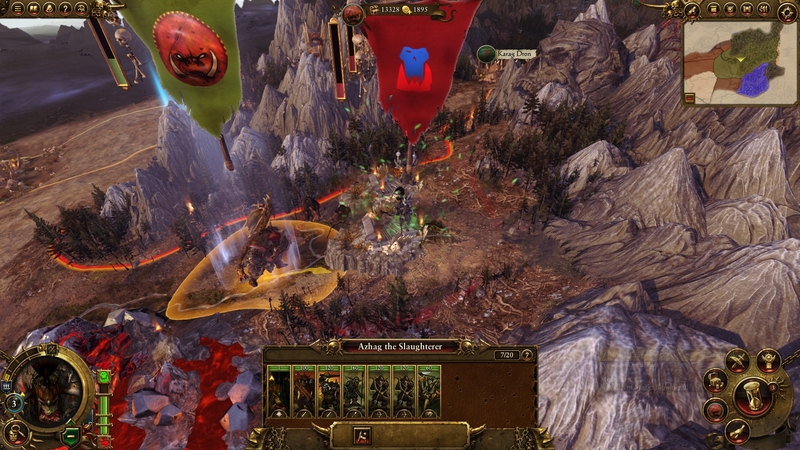 To sum up, Total War: Warhammer is more focused on combat than empire management. The 4X side of things has been dumbed down, while at the same time having many of its elements obscured. Combat is your usual TW affair, not a lot has changed except some flashy new locations, creatures and magic. 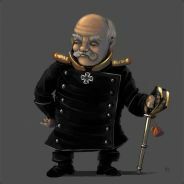 I found myself surprised with the lack of certain combat features from Rome II, reducing battlefield strategies even further. 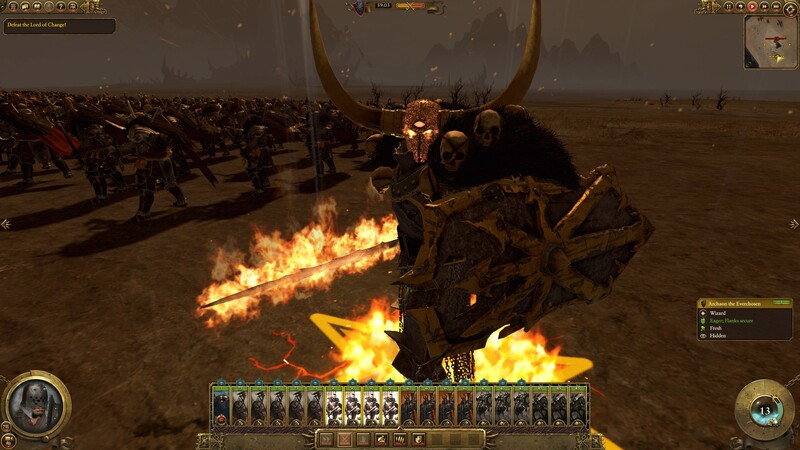 However combat on the whole is: bombastic, fun and the Warhammer lore fits the Total War style perfectly. 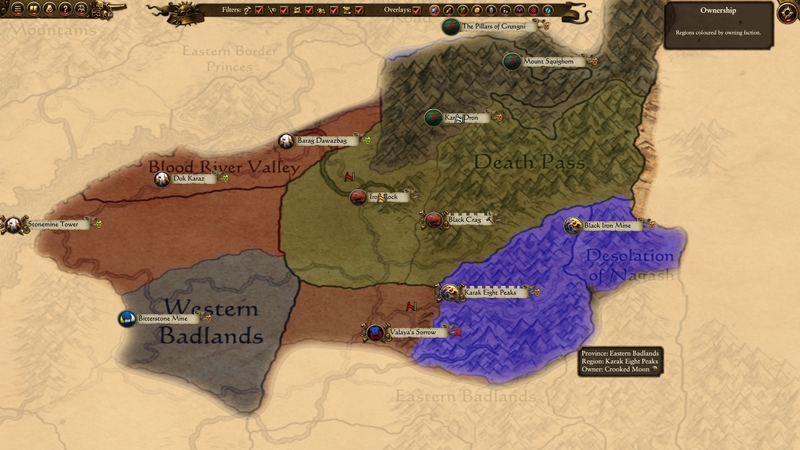 The biggest saving grace to TWW, are the detailed and asymmetric factions. I am looking forward to playing the game through with each race, because the campaign will be markedly different each time, although compared to other 4X games the setup variables here are extremely limited. 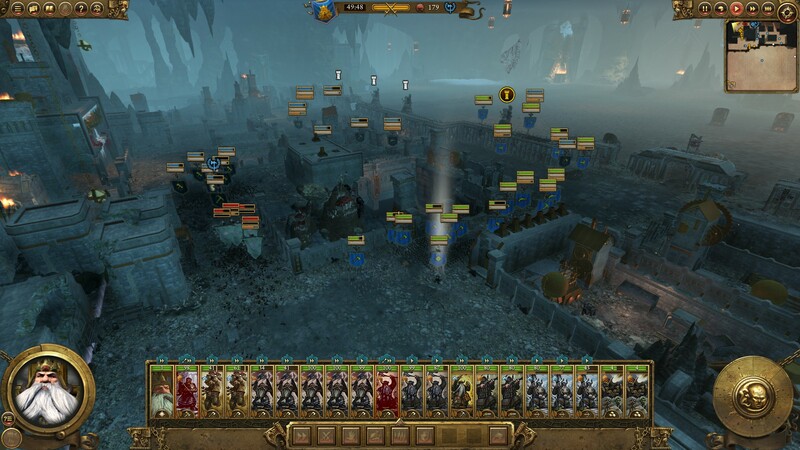 Creative Assembly please take note – strategy gamers enjoy some strategy!